« Herzog’s BAD LIEUTENANT is so good it almost makes me want to smoke crack! A Grindhouse Christmas @ the New Bev! For the past three years I’ve made it a yuletide tradition here in L.A. to attend the annual Grindhouse Film Festival Christmas show at the New Beverly Cinema. 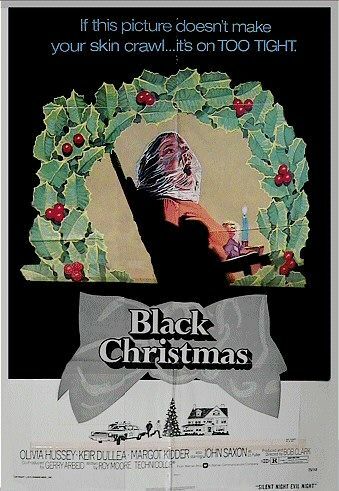 The first year I went, it was a double bill of the perennial favorite BLACK CHRISTMAS (1974) and the incredible Santa Claus slasher from Utah, SILENT NIGHT, DEADLY NIGHT (1984). Last year it was once again BLACK CHRISTMAS along with a haunted house Xmas movie called SILENT NIGHT, BLOODY NIGHT (1974). 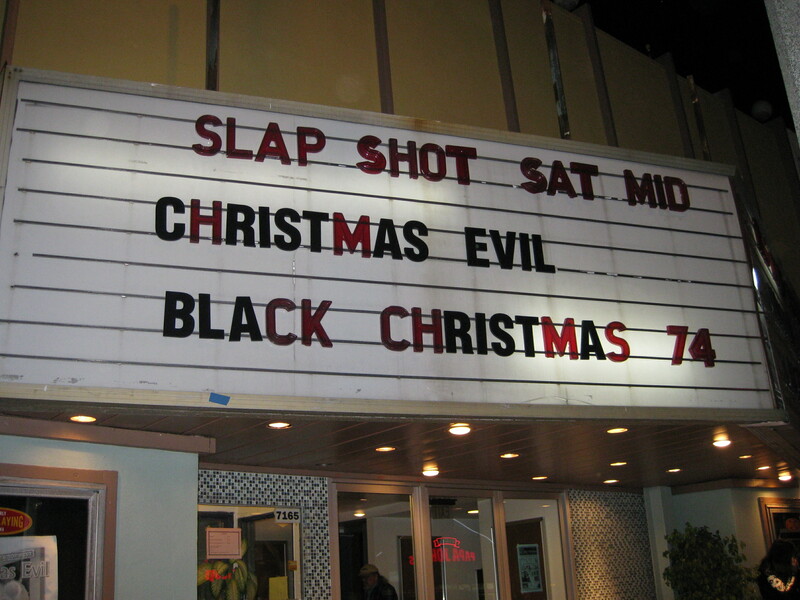 This year it was the amazing CHRISTMAS EVIL (1980) along with once again, the ever popular BLACK CHRISTMAS. It was a rockin’ show. I’d seen CHRISTMAS EVIL awhile ago on cable and thought it was good, but I really loved watching it again with the Grindhouse crowd and it has now become one of my holiday favorites. Before the show, the star of the film BRANDON MAGGERT came out to introduce it. He did a brief and very amusing Q and A, but had to cut it short because he hadn’t eaten dinner yet and wanted to get home. I’d like to mention how great it was that over the last 30 years his hair has turned white and he now sports a beard and square framed reading glasses that really make him look a lot like old St. Nick. If you’ve seen the film before, you’ll understand how awesome this is. BRANDON MAGGERT discusses the finer points of CHRISTMAS EVIL. 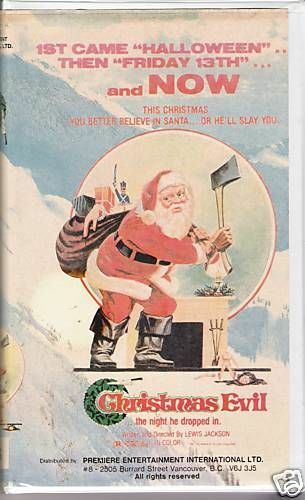 Before the movie there was a special Xmas trailer reel that included two really bizarre looking films called SANTA CLAUS (looked like a Grimm’s fairy tale version of the story) and THE CHRISTMAS THAT ALMOST WASN’T (like a Hammer horror version of a Xmas film), an anime HEIDI clip and LAST HOUSE ON THE LEFT (why I don’t know). CHRISTMAS EVIL (A.K.A. YOU BETTER WATCH OUT, which was the title on the director’s print we saw) tells the tale of Harry Stadling (BRANDON MAGGERT), a worker in a toy factory called JOLLY TIMES TOYS, who is really obsessed with all things Christmas. He’s taken to spying on the local kids in the neighborhood, to see who’s being naughty and nice. 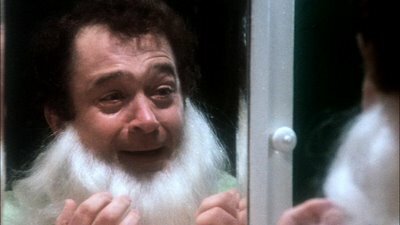 The closer he gets to the 25th of December, the more manic his obsession grows, until finally he decides to actually “become” Santa Claus. Donning a Santa suit and converting his van into a sleigh (complete with reindeer painted on the side), he takes off on Christmas eve night to teach the city the true meaning of the holiday, even if he has to commit murder to prove it! "You talkin' to me, Santa? You talkin' to me?" Simply the greatest image ever and next year's Xmas card. 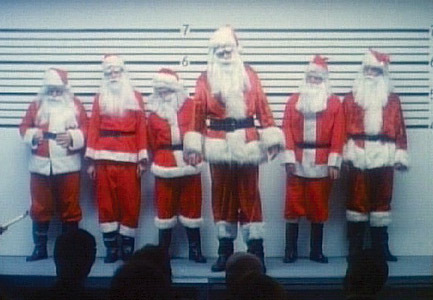 CHRISTMAS EVIL is a highly entertaining black comedy horror film that is kinda like TAXI DRIVER if Travis Bickle was a violent Santa Claus impersonator. There is nothing more pleasing to my twisted holiday senses then watching an angry mob of torch wielding New Yorkers chase Santa Claus through the streets of Queens. 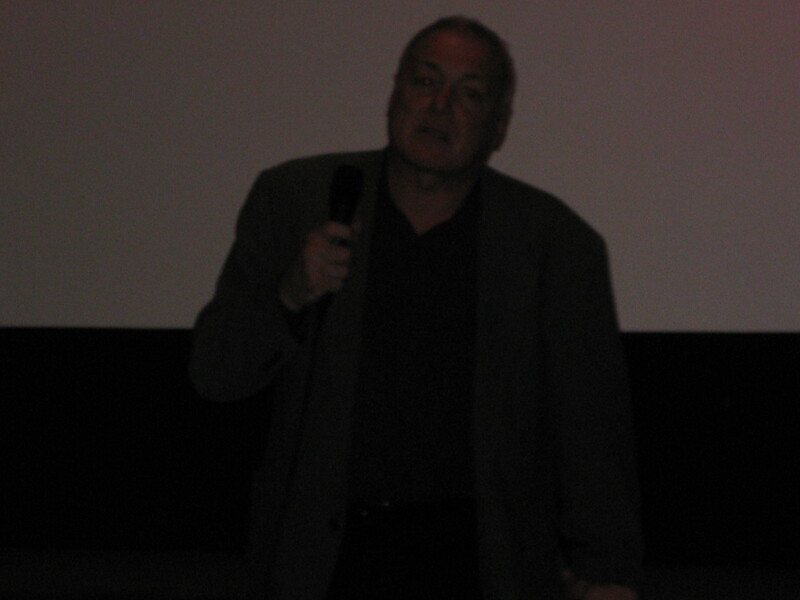 It went over very well and afterwards we were treated to a nice Q and A from the director, LEWIS JACKSON. 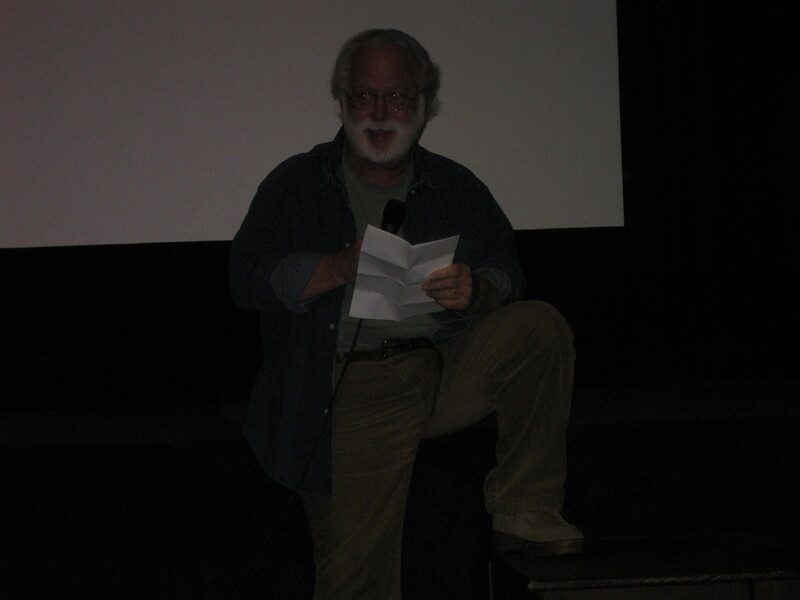 LEWIS JACKSON tells the New Bev crowd the joys and sorrows of directing CHRISTMAS EVIL. 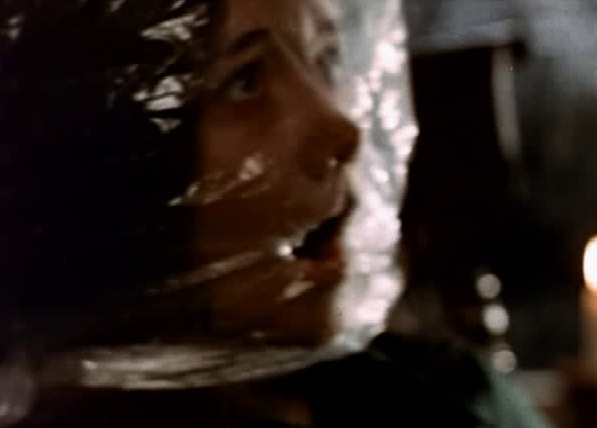 If you’ve never seen Bob Clark’s Canadian made prototype holiday slasher classic BLACK CHRISTMAS before and think you’re hip on the genre, you’re not. This is the FIRST of its kind and is clearly a major influence for JOHN CARPENTER’S HALLOWEEN. It started all the staples of the slasher formula, including the killer POV shot, the one by one stalk and kill and the lone survivor girl. It also happens to be one of the most effectively frightening of its kind. A hapless victim of the deranged killer. This image consistently raises the hairs on the back of my head every single time I watch it. A group of sorority sisters are all preparing to go home for Christmas vacation, completely unaware that a psychotic killer is hiding in their attic, ready to pick them all off one by one. The unknown maniac taunts them from time to time with a series of the creepiest obscene phone calls imaginable, while the inept police try to trace them. 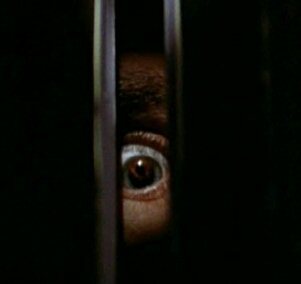 After eliminating a huge red hearing, the film concludes with one of the most erie endings ever, where the killer is still loose in the house with the last survivor and we still have no idea who he is or why he’s doing it. It’s brilliant and I think it’s a lot more frightening than if we were told his motivations and he were caught or killed. It was another amazing Christmas at the Grindhouse and Brian Quinn told me he’s going to try to get a print of the sublime street corner Santa slashing epic DON’T OPEN TILL CHRISTMAS for next year. Can’t wait for then and in the meantime, I’ll try to be a little nicer and a little less naughty. If I can. Merry Christmas to everyone from Planet of the Nerds and a Happy New Year too! And stay tuned for my BEST OF 2009 list coming soon! This entry was posted on December 18, 2009 at 10:39 pm and is filed under Uncategorized. You can follow any responses to this entry through the RSS 2.0 feed. You can leave a response, or trackback from your own site.